Sixth form students have been on a school exchange visit to Nürtingen in Germany recently. They were staying with families of pupils from the Max-Planc-Gymnasium school. 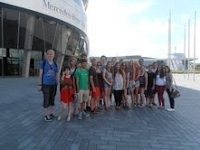 Earlier this year the German students spent some time staying with Rhydywaun families and getting to know our local area, so the Sixth Formers were looking forward to their return trip to Germany and had an excellent time with their German host families! Thank you to Mrs Sandra Seldon and Miss Sian Harries for arranging the trip.